The lot includes Captain Jack Marriotts extraordinarily detailed accounts of the negotiations, alongside two autograph letters, a sheet of blotting paper used at the Armistice and a printed text of the terms of the Armistice itself. © Christies Images Limited 2018. LONDON.- On 12 December, Christies will offer eye witness accounts of the Armistice which ended the war to end all wars (estimated - £10,000 - £15,000). The lot includes Captain Jack Marriotts extraordinarily detailed accounts of the negotiations, alongside two autograph letters, a sheet of blotting paper used at the Armistice and a printed text of the terms of the Armistice itself. Marriott was one of only four British participants, and the notes and mementoes he kept summon up the scene with extraordinary vividness. Christies is pleased to offer such significant archival material on the year of the centenary of the end of World War I. The Armistice was negotiated between a remarkably restricted group of participants, comprising seven on the Allied side and six on the German side, including translators. For the three days of negotiations, all were living and working in a pair of French military trains in a clearing of the Forest of Compiegne behind French lines. The Allied group was headed by Marshal Foch, with Admiral Wemyss the senior British representative and head of the naval delegation, to which Marriott was also attached and whose negotiations he recounts in detail. The scene was set in a forest in northern France, typical November weather. Two railway carriage stood 200 feet apart: at precisely 9 a.m., as agreed, six men emerged from one and made their way to the other along the temporary duckboard path that had been laid over the boggy ground. One of those watching thought to himself that I have never seen a more miserable lot of men. They were led by Matthias Erzberger, the son of a postman from southern Germany, fat and bloated looking, double chin, scrubby moustache, wears pince-nez; beside him was Graf von Oberndorf, a polished gentleman; just behind them, Captain von Vanselow, a naval officer who does not look at all like a sailor, more like a pork butcher. At the door of the second carriage they were received by a French general, who bowed stiffly, alongside a 38 year-old British naval officer, Jack Marriott, who was mentally recording every detail of these events. It was Friday 8 November 1918: the German delegation had arrived in the Forest of Compiègne to sign the Armistice that would end the war to end all wars. There were moments of accidental comedy: Weygand, as the German delegation approached, was suddenly paralysed by a point of etiquette: how, from a point of view of courtesy, do you receive the representatives of a country with whom you have been engaged in a war of unprecedented destruction for the more than four years? Then the Allies asked the Germans for their credentials (to prove they were the legal representatives of the German government)  but Marriott wryly noted that it was lucky the Germans did not retaliate, as they had not thought to bring any themselves. Marriots account fills in some lost details of history: like the fact that the Great War was prolonged by a whole day because the German party had failed to bring a code with them by which they could send the armistice terms back to headquarters: so the papers had to be sent back across the front line by motorcar, a process which took 36 hours. Then when Captain Marriott tried to phone Buckingham Palace to inform King George V that the war was over he was almost defeated by the primitive telephone technology: the line was dreadful and I must have been cut off about 30 times. And then there are the human vignettes: the junior German representative taking the Armistice terms back to his government with a bottle of beer in each pocket and crying his eyes out'. It had been immediately clear to the Allied party that the German delegates, caught between absolute military collapse on the front and starvation and revolution at home, would accept almost any terms. And so, after three days of cursory negotiations, at 5 oclock on the morning, Maréchal Foch, Admiral Wemyss and the four German delegates signed the document which declared an end to a war which had lasted for more than four years and killed 7 million military combatants. The guns would fall silent exactly six hours later, at 11 oclock on the eleventh day of the eleventh month of 1918. They filed out of the railway carriage, the Allied party to return ecstatic to Paris, where Foch and Wemyss danced ring-a-ring-a-roses around the Elysée Palace with the French president Clemenceau, and the Germans to make their despondent way home to a nation in a state of starvation and social collapse. 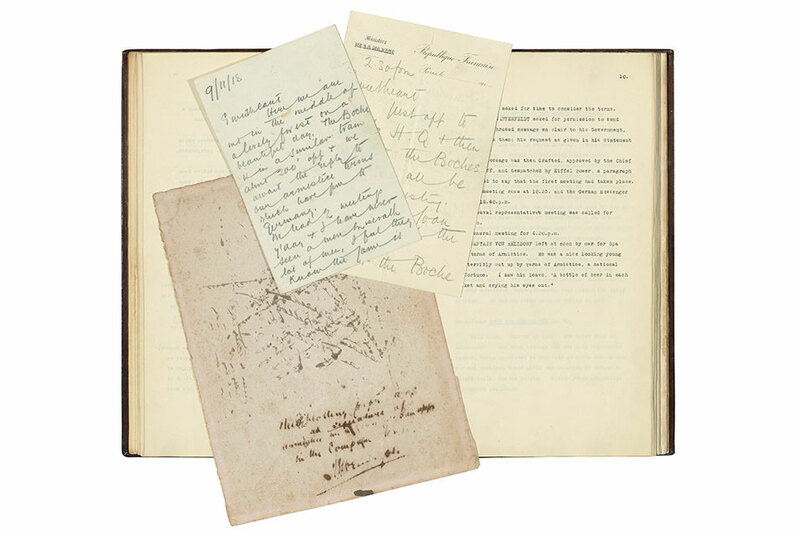 Captain Marriott took one last look round: on the table where the Armistice had been signed lay a sheet of blotting paper, the ink from the signatures still soaking into its fibres. Marriott slipped it into his file, and added it to his small collection of keepsakes from his brush with history. His memoir ends on a remarkable note of calm understatement: We then had a glass of port and went for a walk in the Forest which was wonderfully soothing after our busy night. This lot will be offered in the Books and Manuscripts auction on 12 December as part of Classic Week at Christies London.